Our 3rd ANNUAL CAYMAN BRAC FAMILY WEEK took place July 10th - 17th, 2005. Keep checking the site for more information. During Family Week there will be many opportunities for your youngsters to experience the water in a safe and fun environment. Here's a description of what they can look forward to. Family week packages and airfare are available through 1-866-THE-BRAC (866-843-2722). $ 599.00 per person based on double occupancy. $ 110.00 for child under 12 staying with their parents. Price includes 7 nights accommodations, Family Week Pass, hotel taxes, transfers to and from the airport. The Family week pass covers all land based activities, childrens' Learn to Snorkel, and SASY (Supplied Air Snorkeling for Youth). Diving, Bubblemakers and boat trips are offered for additional costs. See below or call for details. Please note that all children under 12 must be accompanied by an adult. For additional packages available, please click here. Hop aboard our island bus and spend a morning or afternoon seeing many of the sights of Cayman Brac. Along the way you will visit one of the many caves that dot the limestone walls. These caves once provided shelter during hurricanes but are now a cool respite from the summer sun. The route will then take you to the farthest and highest part of the island - Lighthouse Point. View the spectacular bluff as the waves hit 140' below. Care should be taken with young children. Heading back from the Lighthouse, stop at the Bight Road North Trail and enjoy a short stroll on the boardwalk into the forest. The tour will then cross over to the north side of the island where you will enjoy a scenic drive to the museum and then back to the hotel. Before the Brac became a diving destination it was known as a "birders" haven. Spend a few hours with renowned Cayman Islands ornithologist, Patricia Bradley as she guides you to the favorite resting and feeding spots of some of Brac birds. This scenic walk will take you to the east end of the island at the top of the bluff where not only will you see the geology and vegetation of this unique unspoilt region but you will also see magnificent frigate birds and brown boobies swooping down over the bluff as they catch some of the air currents. Brown boobies nest precariously along the edge and their fluffy white chicks stand out against the brilliant blue sky. Because of the dangers of the cliffs and the rugged terrain we recommend that children younger than 10 not go on this tour. The kids will have a great time as they learn to identify island birds and trees. The bus will then take them to the west end ponds and then on to the Bight Road Boardwalk. Stroll along the boardwalk looking for the Cayman Brac parrot as well as other forest birds. This is a relatively easy tour but kids must be accompanied by an adult. Learn about the flora and fauna of Cayman Brac as you traverse this easy hike through the Cayman Brac Parrot Reserve. Listen for the squawking of parrots and view the variety of bromeliads and tree orchids that grow here. Following the hike, cross the road to the Bight Road North Trail and take a stroll on the 650' boardwalk into the forest. Join world-renown ornithologist Patricia Bradley as she briefly traces the history of Cayman Brac and its people and talks about nature tourism and the birdlife of the forests, wetlands and bluffs. This is an ideal introduction to Cayman Brac before you set off exploring it on some of the tours. The Sister Islands boast some of the best diving in the world. Come and see why! Experience the underwater world through slides and stories. Anyone can join in the fun. We will have paints and brushes but you need to find something to put your sign on - a piece of drift wood, coconut, whatever you can find. Take a look around the properties and see what signs are already there. 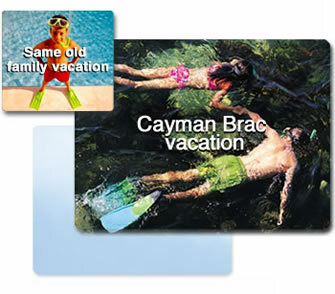 Come up with a great saying for your family or friends that will let everyone know you were on the Brac for Family Week. The kids can have a fun afternoon of creating posters for the poster contest. There will be a category for those 10 and older and those who are younger than 10. Paper and markers will be provided but if the kids have something they would like to use as well have them bring it along. Let the kids make something to take home with them. There will be lots of paper, paint, markers etc and suggestions for what to make. 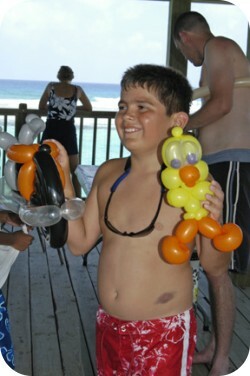 Matt Tyson, the Balloon Guy, will also be there to help out with balloon tying projects. A big part of being on the Brac is learning about the water and the creatures that inhabit it. Kids will have fun coloring reef pictures, identifying pictures of fish and playing games that will help them learn about the environment. The morning will start off with a Scavenger Hunt for the kids. The Scavenger Hunt will ask questions about Cayman Brac. The answers to all questions can be found in the area from the start of the resorts to the western tip of the island. The younger kids may require adult help. Once the hunt is completed, everyone can enjoy lunch and some games. Not only will there be a great cookout of hamburgers, hotdogs and salads but there will be plenty of games for the kids to enjoy. See who can coach a soldier crab into moving the fastest (moving may be an option! ), toss a frisbee the most accurately or throw it the furthest. Enjoy an hour of snorkeling at Radar Reef (weather dependent). Radar Reef provides easy access to the reef no matter what your skill level. Bring along your reef id card to help identify some of the fish and critters you will see. This is also the location of the Oceanic Voyagers statue that was sunk in January 2003. It is a bronze sculpture of 2 dolphins and 4 stingray. The perfect way to see the bluff and the shoreline. Enjoy the afternoon on board the boat as we travel along the south shore from the west end to the east end. See the booby birds and magnificent frigates as they soar over the cliffs. As we round the tip of the island you will see the rock island known as Little Cayman Brac and the district of Spot Bay. Weather dependent. Brac has some great shore snorkels but it is always fun to take a boat trip to a site that you can't get to as easily from shore. A cool way to spend the afternoon. Bloody Bay Marine Park is world renowned for its fabulous reef, wall and marine life. Hop aboard for a 40 minute ride from Cayman Brac to Little Cayman and then spend an hour counting more fish than you can imagine. Weather dependent. Enjoy sand between your toes as you sample some fine island cooking. Taste spicy jerk chicken or maybe sample some local fish done Cayman style. There will be some fabulous raffles so don't miss out on this event. If the kids like the water already, why not let them try snorkeling. During the "Learn to Snorkel" hour they will learn how to use their mask, snorkel and fins. Activities and games will be held in the shallow end of the pool but the opportunity for trying to swim to the deeper end will also be offered for those that are comfortable. Snorkel gear will be available for use during this time. SASY stands for Supplied Air Snorkeling for Youth and it is easy and fun. Kids will use the special SASY equipment which includes a vest, small air tank and regulator. The vest is designed so that they can't submerge and the regulator is positioned so that even if it falls out it can easily be replaced. Is your child ready to try scuba diving but not quite ready to get certified? Then let them give Bubblemakers a try. Kids will be introduced to the scuba unit, learn how to clear their mask, how to clear their regulator and practice swimming under the water. The initial training will be offered in the swimming pool. If they then just love it, a further experience in the channel can be arranged. A complete scuba certification course, 5 days of instruction and diving. The days will be spent in classroom sessions, practicing skills in the swimming pool and enjoying shallow dives on the fabulous Cayman Brac reefs.